Alison challenges corruption. Now she's challenging Feinstein. Help us reach our next goal by June 1st so that we can continue to build our grassroots team of supporting volunteers, getting out the vote, hiring staff, and making sure California knows about our campaign to fight for justice for all! Grassroots mobilization works. 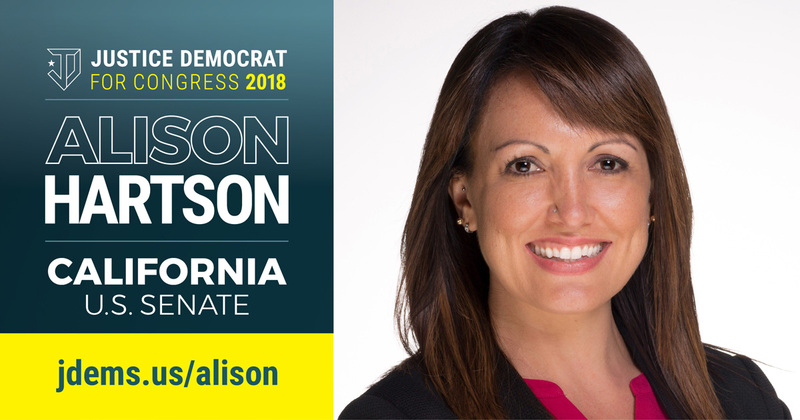 Just four days after announcing Alison Hartson's campaign for U.S. Senate, we passed our fundraising goal by $10,000 at $30 a donation. This is how we show the world that we are unstoppable. Help us keep up the momentum and build our grassroots team. Let's keep proving the skeptics wrong! Will you join our cause and contribute $27 today?